Honda is appealing the decision after the victim’s injuries were blamed on the Odyssey’s poorly designed seat belt system. A woman in Texas has been awarded $37.6 million by a jury after being involved in a crash back in November 2015 that left her paralyzed. According to Dallas News, 27-year-old Sarah Milburn was taking an Uber ride in a Honda Odyssey minivan when the driver ran a red light and was hit by a pickup. She sued Honda in late 2016, with her attorneys arguing that her injuries were caused by the minivan's poorly designed seat belt system. Milburn is now a quadriplegic with only minimal use of her arms and hands. Like many other vehicles manufactured at the time, the seat belt system of the 2011 Honda Odyssey’s middle seat incorporates a detachable shoulder strap that must be pulled down from the ceiling and anchored to the seat before it can be pulled over the passenger’s hips and buckled. While this seatbelt system isn’t uncommon, an expert demonstrated to the jury that less than 10 percent of people unfamiliar with this type of seat belt were able to use it properly. "Sarah put the seat belt on the same way 50 out of 53 people in our studies did, and wearing it that way was actually more dangerous than having no seat belt at all,” attorney Charla Aldous said. After Milburn was awarded $37.6 million, Honda says it plans to "vigorously appeal” the decision. 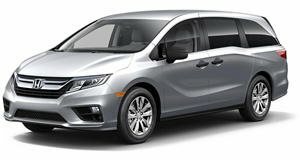 "The design of the seat belt system for the middle passenger in the third row seat in the 2011 Odyssey complies with all applicable federal safety standards and is similar in design to virtually all comparable minivans of this vintage," Honda said in the statement. "If it had been worn properly in this crash, the plaintiff would have suffered no serious injuries." According to court documents, the jury also found that regulations governing seat belts didn't do enough to protect the public from harm. Milburn’s family is hoping the finding could lead to a law preventing other car manufacturers from using the same seat belt design.